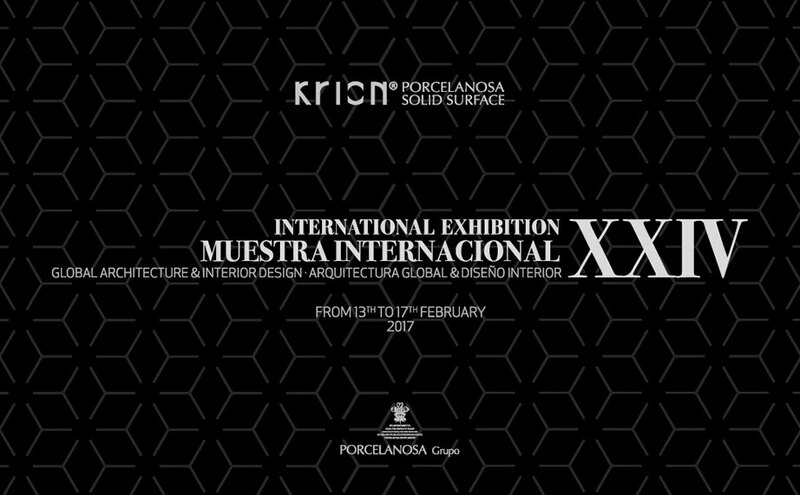 The countdown for the 24th edition of the Global Architecture International Exhibition by PORCELANOSA Grupo is now on. It is a worldwide event which will be held from February 13th to 17th this year. The eight firms from the Grupo are finalising their showrooms for 2017, innovative exhibition areas where they can show their latest designs and trends regarding materials and products. The International Exhibition by the PORCELANOSA Grupo foresees future design by showing the professional audience, clients and suppliers, as well as the international press, how the housing or commercial space concept will be set up. All the showrooms will be provided with elegance, uniqueness and high level technology so that every single piece and product blends into an atmosphere, in an exclusive and realistic way. Therefore, getting into the PORCELANOSA Grupo Exhibition means walking around a world of ideas, trends and new designs, which make professionals become inspired, as well as going deep into the endless possibilities offered by architecture and interior design. Among the materials offered by the 24th International Exhibition, one can discover the latest designs regarding flooring and ceramic wall tiles, ranging from wood and ceramic stones to textured, which have been created to impress and reinvent the contemporary design. Furthermore, Porcelanosa and Venis are characterised by their high quality and luxury, as well as by their wide range of formats, including the large-scale “XL”. Natural materials will also play a major role at the 24th International Exhibition done by L’Antic Colonial, as well as the linkfloor and laminate flooring or their mosaics. Furthermore, in its showroom, Urbatek, will display its latest designs for the full thorugh-body porcelain tile and the extra-slim porcelain tile, including its marble-inspiring XLight Premium models. The Premium concept will also focus on the kitchen and bathroom, through the designs of both Gamadecor and Noken. The former will make its exhibition area stand out thanks to the latest Premium Emotions® kitchen models among other designs. Noken will surprise the audience thanks to Vitae by Zaha Hadid Design and Tono by Foster+Partners, bathroom collections which are both unique and futuristic. The KRION® mineral compact will show its numerous applications once again, both for bathrooms and furniture, and in endless wall tiles or as the ideal material for the installation of outstanding ventilated façades. Butech will address the professional audience through its cutting-edge designs and high-technology building systems, therefore, making both the project uniqueness and the installation process easier. All of this ensuring high durability and resistance. This 24th PORCELANOSA GRUPO Global Architecture International Exhibition hopes to break the attendance record. The average number of visits recorded in previous editions is 12.000, with people coming from over 80 different countries.